A New Hampshire teenager battling cancer got a day out of her wheelchair and spent it in the driver's seat of a police cruiser instead. Fourteen-year-old Nashua student Aaliyah Davis remembers the day vividly. August 4, 2016 was when she found out she was living with cancer. Life as she knew it was about to change. “I liked to do basketball and cheerleading,” she said. But now, the things she used to enjoy are a struggle. “Trying to eat because of the chemo, the chemo doesn’t want me to eat,” she told necn. 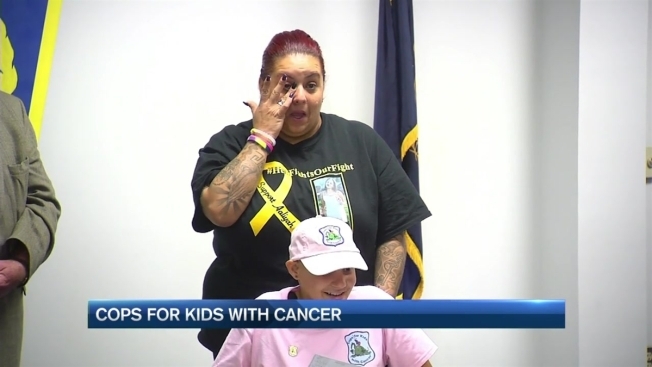 But on Wednesday morning, the smiles were coming easier, thanks to the Nashua Police Department and a Massachusetts charity called Cops for Kids with Cancer. “To watch her, the same age as my daughter, going through what she’s going through, it makes you appreciate what you have,” said Nashua Police Deputy Chief Michael Carigan. Officers donated $5,000 to Davis and her mom, Sonya. Sonya Davis, who is still trying to make her shifts at a nearby pizza shop, says the money means the world. In just two weeks, Aaliyah will undergo surgery to remove the malignant tumor in her leg. But at least for today, cancer is taking a backseat, as the teenager looks forward to life without it. “I want to be a police officer when I grow up,” Aaliyah said. “To see her smiling like she’s smiling, is very helpful,” Sonya Davis said through tearful eyes. Sonya says a little bit of the $5,000 will be a huge help for Halloween shopping. Aaliyah told necn Wednesday that with that gift, she’s going to buy the best police officer costume she can possibly find.